Mann Packing is recalling 844 cases of 18-oz. 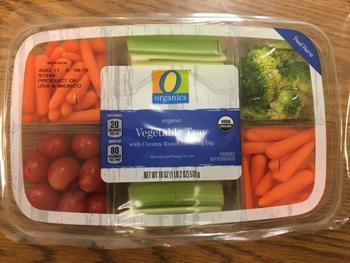 O Organics Organic Vegetable Tray with Creamy Ranch Dressing Dip. The product contains egg, milk and soy, allergens not declared on the label. The recalled product has a Best If Used By date of August 11, 2016 and an incorrect UPC barcode: 21130 98428. The item was sold at Albertsons, ACME, Carrs, Haggen, Pavilions, Pak ‘N Save, Safeway, Shaw’s, Star Market, Tom Thumb and Vons stores in Alaska, Arizona, Arkansas, California, Connecticut, Delaware, Hawaii, Idaho, Louisiana, Maine, Maryland, Massachusetts, Nevada, New Hampshire, New Jersey, New Mexico, New York, Oregon, Pennsylvania, Rhode Island, Texas, Utah, Vermont and Washington. Customers who purchased the recalled product and are allergic to egg, milk and soy should not consume it, but return it to the place of purchase for a full refund. Consumers with questions may contact Mann Packing at 1-800-285-1002 Monday through Friday from 8 am to 5 pm (PST) or by email at info@mannpacking.com. Customers may also call Albertsons customer service at 1-877-723-3929 at any time.